Welcome to the NZORD newsletter for February 2017. I hope everyone had a wonderful break and that your start to the new year is going well. With Rare Disease Day 2017 now two weeks away, planning is well underway, the team have had a busy start to the new year. 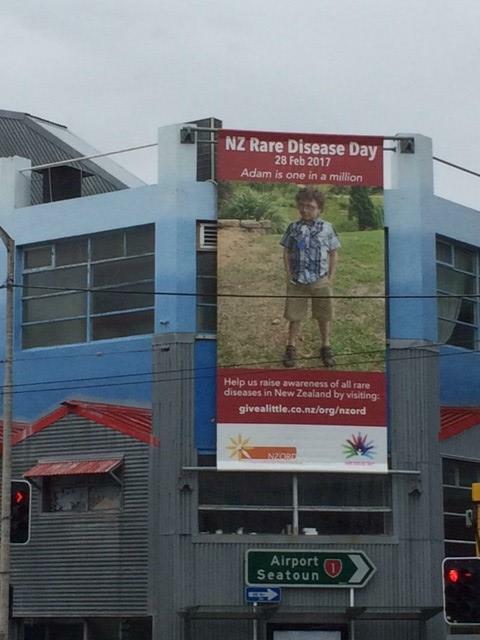 For those of you in Wellington, check out the Rare Disease Day billboard on the corner of Taranaki and Vivian Street featuring Adam Tiedemann. 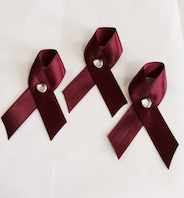 I look forward to seeing as many of you as possible at the NZORD cocktail evening to celebrate Rare Disease Day. If you would like a ticket, please email comms@nzord.org.nz. NZORD is again hosting a cocktail evening at the Wellington Club on Tuesday 28 February 2017 to celebrate Rare Disease Day. 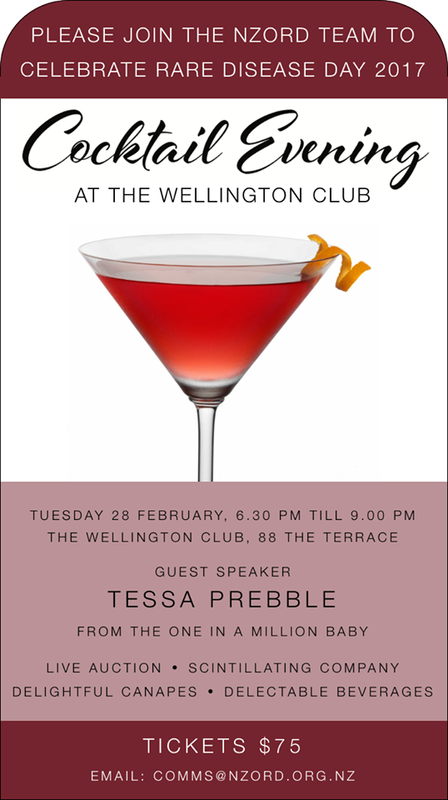 This year's guest speaker is Tessa Prebble. Tessa is a journalism teacher from Wellington, who lost her daughter, Eva, to complications of CHARGE Syndrome at 10 months old. 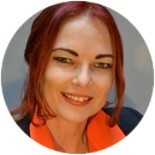 She writes a blog called www.theoneinamillionbaby.com and produces a podcast of the same name. Tessa tells her story and Eva's through her blog, the One in a Million Baby podcast focuses on families living with special and medically fragile kids. Tessa has been recognised by The Washington post and Mumsnet Blogging Awards 2016. Tessa also writes for Spinoff Parents and Huffington Post AU. Tessa is an AMP Scholarship 2016 recipient. There will be a live auction as part of the evening's entertainment, there are some amazing items that will be auctioned on the night including artwork from Heather Wilson, Dean Proudfoot, Rae West and Tania Dally, items from Bluebridge Ferry, The Phoenix, Wellington Lion's Rugby, Foxglove, Royal NZ Ballet and Truffles to name a few. To ensure you don't miss out please email comms@nzord.org.nz to book your tickets. The evening kicks off at 6.30pm. As well as the cocktail evening for RDD 2017, there are many other elements which are keeping the NZORD team busy. The poster for RDD 2017 is complete, it features Adam Tiedemann who we introduced in our last newsletter. Adam is ten years old and has a rare chromosomal disorder, 1q44 deletion along with a 5q34q35 duplication. Here is a preview of the poster. If you are in Wellington be sure to check out the billboard located on the corner of Taranaki and Vivian Street, right above our offices. The billboard also features Adam Tiedemann and looks amazing. We would like to thank Yvonne from the Production Shed for allowing us to promote Rare Disease Day on the billboard. 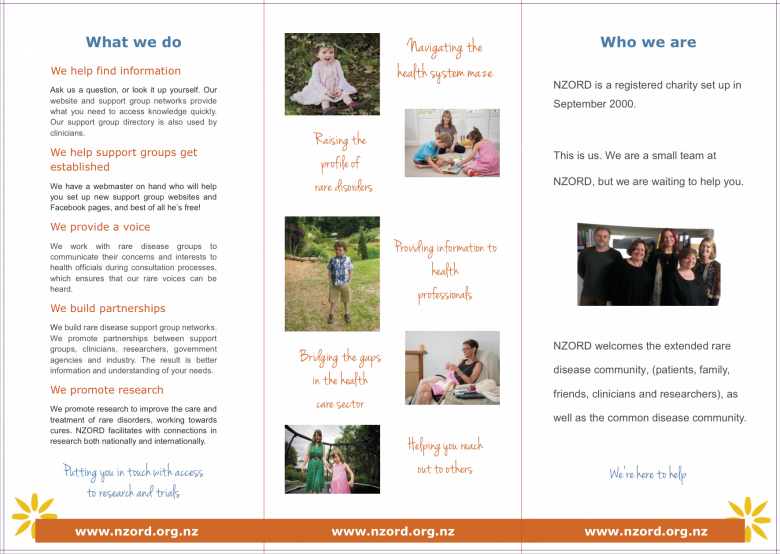 For the first time, NZORD have produced collection boxes for Rare Disease Day. We would appreciate it if anyone could display one of these boxes on counter tops or in your workplaces and deposit any money donated into our nominated bank account after Rare Disease Day. 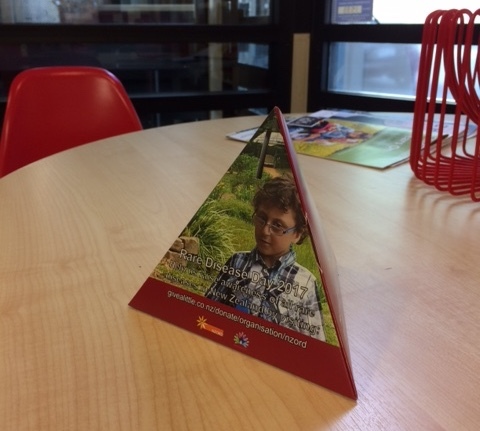 These are available for rare disorder support groups to collect donations for their own groups too, so please let us know if you would like one. Please contact Lyndal at comms@nzord.org.nz for more information. NZORD will again be providing the Rare Disease Day pins to assist with raising money at your RDD 2017 event. The pins can be purchased from us here at NZORD, the cost is $30 for 50 pins. These can then be on sold, our recommended price is $2 to $3. If you would like to order some pins, please email comms@nzord.org.nz. 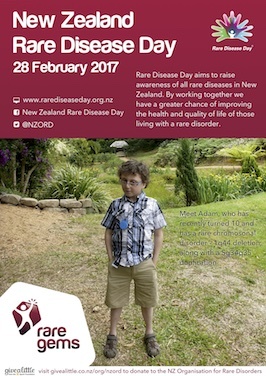 The Rare Disease Day website is updated and NZORD is keen to have as many events registered as possible for RDD 2017. Head along to rarediseaseday.org.nz and register your event, it's a great way to publicise what you have planned. During 2015 Pharmac announced the launch of the rare diseases pilot fund. A fund of $25 million was dedicated over a five year period. Pharmac has approved ten medicines for funding and the Request for Proposal is now closed, an evaluation process is due to begin. PHARMAC have been testing a commercial process aimed at improving people's access to medicines for rare disorders. We think encouraging competition among suppliers could help us improve access to these medicines. We've now approved 10 medicines for funding as a result of this process, which has now ended with the RFP closed. Our next step in this process will be to conduct an evaluation of the pilot. This will look to see whether the pilot has achieved the objectives set out in the original Request for Proposals document. It's likely this evaluation will begin in early 2017. Any decision on whether we might run the process again would depend on the outcome of our evaluation. NZORD has requested that PHARMAC consult with us as part of this evaluation process. NZORD will communicate any updates on this process as information becomes available. SWAN New Zealand is a support group for New Zealand patients and families affected by an undiagnosed genetic condition - a ‘syndrome without a name’. 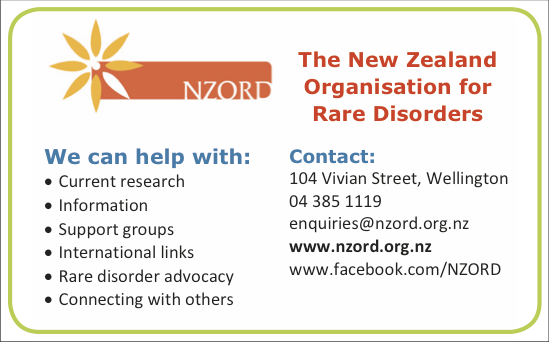 SWAN NZ has been established by the New Zealand Organisation for Rare Disorders (NZORD). SWAN NZ has now been running for six months, we have 16 members and would like to hear from anyone else who would like to join. SWAN NZ now has its own logo which we are very proud of, special thanks to Harry Ambrose who donated his time and creative talents to come up with the logo. A SWAN NZ Facebook page has been set up and a Twitter account will be opened in due course. To visit the Facebook page, head to www.facebook.com/SWANNZ/ [link no longer active]. There has also been a closed Facebook page created for members, if you would like to join this group please email Lyndal.bremer@nzord.org.nz with a link to your Facebook profile and you will be added to this group. Any posts or discussions which take place on this page will only be seen by the members of this group. We have our first patient story that has been added to the website, check it out. We would love some more patient stories to add to the website, sharing your story can be a huge help to other people out there struggling without a diagnosis. The Goodfellow Symposium in Auckland is taking place in March this year. Dr Tony Townsend (one of our GP working group members) is speaking at the symposium. Details of his presentation are outlined below for anyone planning on attending. Rare presentations, defined as those that a full-time GP will see only once or perhaps twice in a practicing lifetime, occur quite frequently. A GP can expect to see two or three of these rare presentations every year. A summary of 120 presentations recorded at the Whangamata Medical Centre over the past 15 years will be presented. Rare disorders are even more common. These are defined (in NZ) as those conditions that have a prevalence equal to or less than 1 in 2000 of the population. About 6-8% of the population have one of around 6000 to 8000 rare disorders. This is about the same as the overall prevalence of known diabetes in New Zealand. Results from the patient support group survey which NZORD rolled out in 2015 identified that there was a real need to assist primary care practitioners in the rare disorders space. In fact only 19.4% of support groups surveyed rated their general practitioner as having a good understanding of their rare disorder, or even knowing where to turn to next for information. To help GPs connect with specialists who have had at least some experience caring for a patient with that particular rare disorder. We are pleased to advise that by reaching out to our very own 250+ wonderful support groups we were able to collect the names of specialists across the country – thank you! This along with the fantastic efforts of Cervin Media led to the beginnings of a NZ Rare Disorders Specialist Directory. It is hoped that this list will go from strength to strength, and assist general practitioners in connecting with others in the often challenging world of rare disorders. An easy to navigate encyclopaedia of rare disorders. NZORD sees Orphanet as the gold standard for this, so we have promoted Orphanet to GPs around the country. Some informative literature that could be given patients as a starting point. 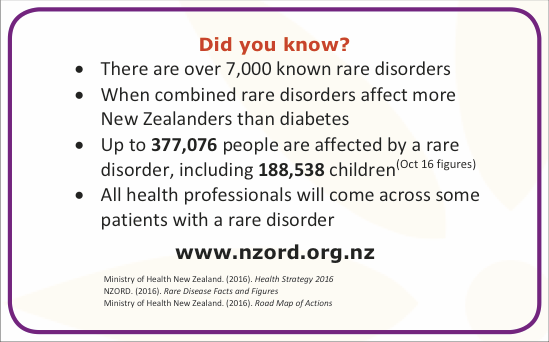 Many were quite surprised to note that when combined rare disorders affects more people than diabetes in NZ! 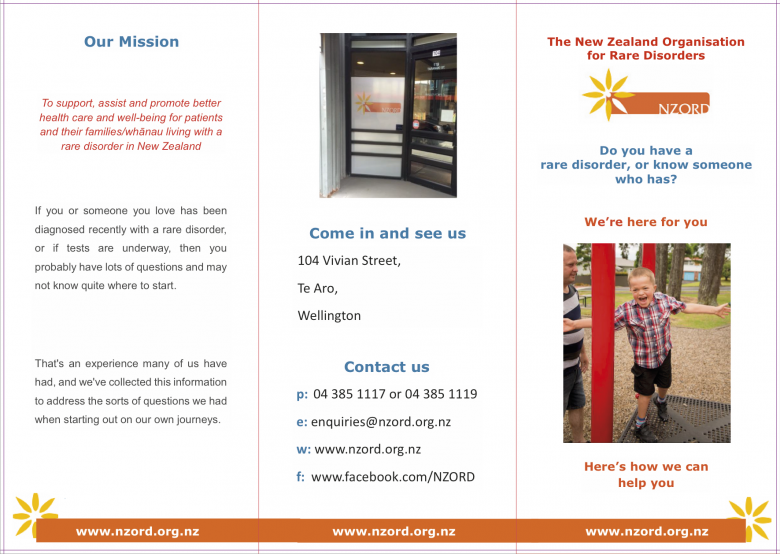 A leaflet and information card have been developed, these can be ordered by emailing enquiries@nzord.org.nz.